1st Half 2018 Private Equity M&A Trends Report - Berkery, Noyes & Co., LLC. The largest sponsored transaction in the Software horizontal in 1st Half 2018 was KKR’s announced acquisition of BMC Software, which offers cloud and IT management solutions to enterprises, for $8.5 billion. Of note, BMC was acquired in 2013 by a private investor group led by Bain Capital and Golden Gate Capital for $6.69 billion. 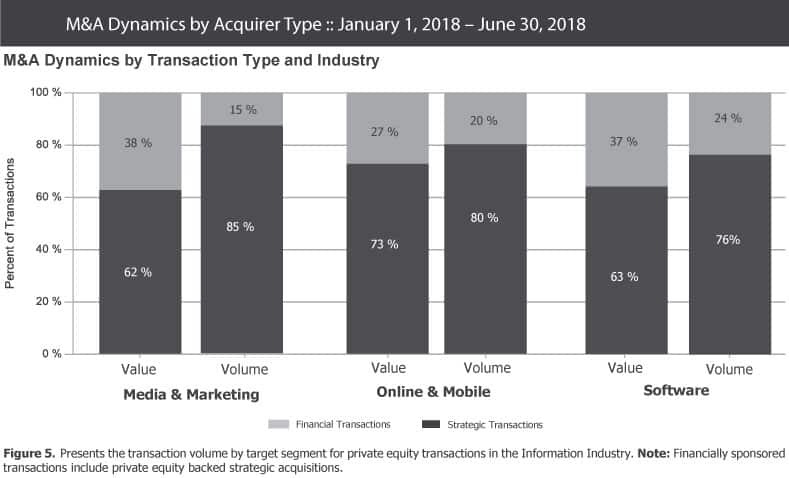 As for the Finance vertical, the largest sponsored transaction in 1st Half 2018 was a Blackstone Group led consortium’s announced acquisition of a 55 percent stake in Thomson Reuters Financial & Risk division for $11 billion. Regarding the Healthcare IT vertical, the largest sponsored transaction in 1st Half 2018 was Veritas Capital’s acquisition of the Value-Based Care Division from GE Healthcare for $1.05 billion. 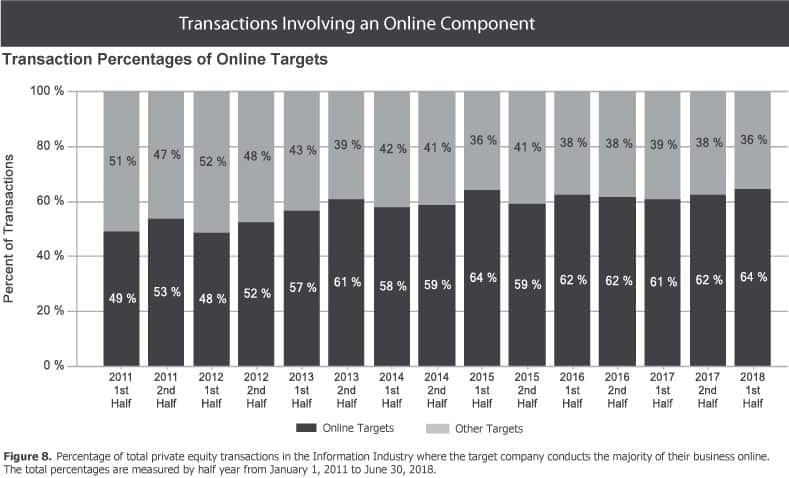 Total transaction volume in 1st Half 2018 rose by five percent over 2nd Half 2017, from 406 to 427. Total transaction value in 1st Half 2018 increased by 61 percent over 2nd Half 2017, from $28.93 billion to $46.48 billion. The median revenue multiple declined from 2.7x in 2nd Half 2017 to 2.3x in 1st Half 2018, returning to its 1st Half 2017 level. 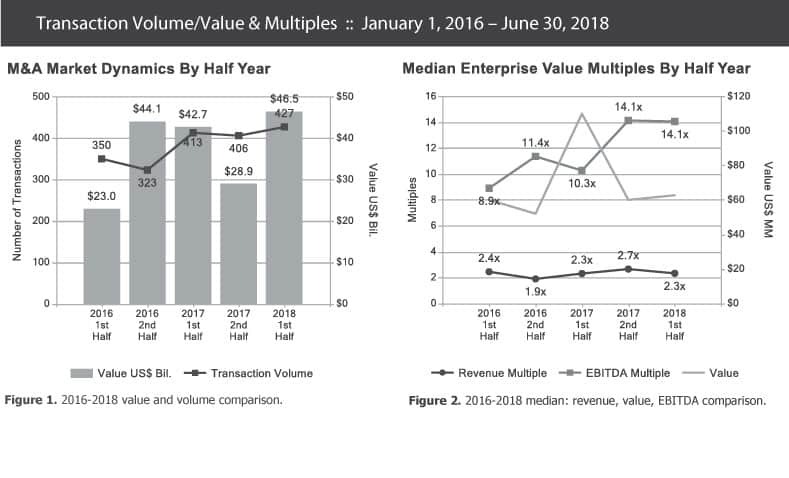 The median EBITDA multiple remained constant on a half year basis at 14.1x. Berkery Noyes tracked 1,919 private equity transactions between 2016 and 1st Half 2018, of which 316 disclosed financial terms, and calculated the aggregate transaction value to be $137.58 billion. 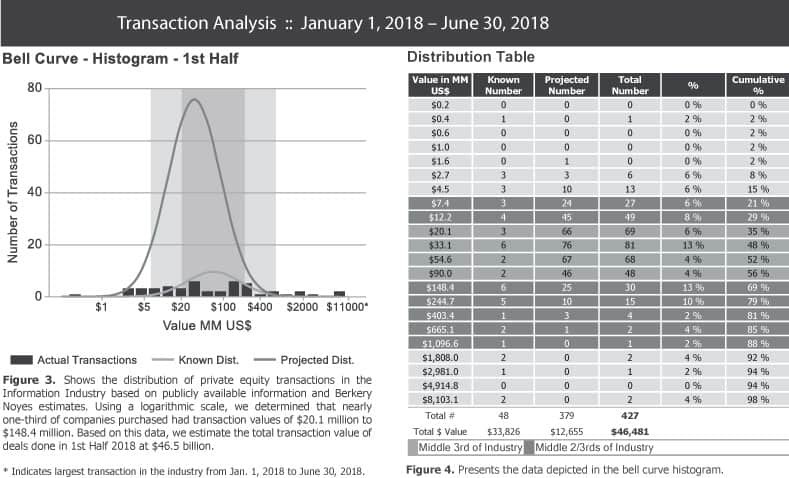 Based on known transaction values, we project values of 1,603 undisclosed transactions to be $45.31 billion, totaling $182.90 billion worth of transactions tracked over the past two and a half years. 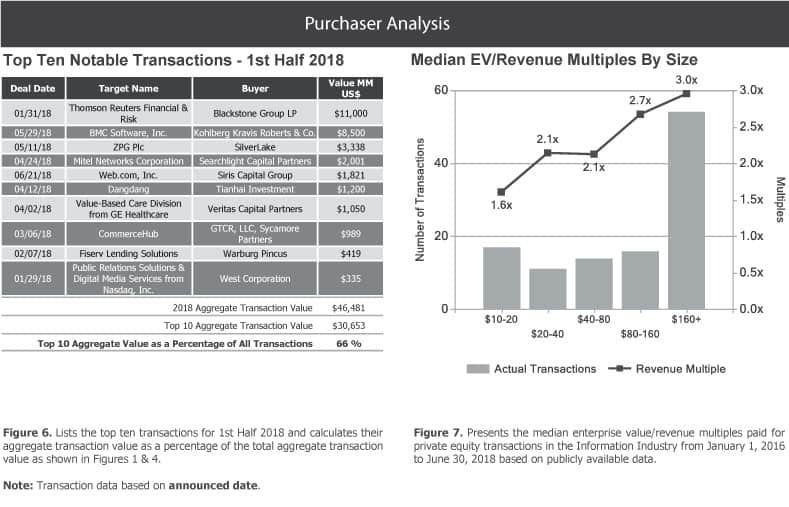 Disclosed median revenue multiple for all segments combined in this report in the last 30 months were 2.3x revenue and 12.1x EBITDA.